NEW STORE Content!- New Site Gallery COMING SOON! For the past month I’ve been working alongside a good friend to re-work from the ground up a new Gallery for the site so I can start uploading new art to the site. I just can’t use the old system anymore because of its cumbersome nature. I had to manually create every single thumbnail and link manually for each pic, resulting in many times with broken links. And most importantly it was a time consuming work that prevented me to make often uploads. And now I’m doing away with that. With commissions and comics I just don’t have the time anymore to be editing html files and such. This NEW Store will contain ZIP files with Art Content from my recent work At my Patreon Page. These Zip Files will be added here a month later after being delivered to my Patreon subscribers (Example: my September Loboleo’s content is delivered to my patrons starting October, this zip will be at the store the first week of November). Note: These zip are “Alpha Tier” content, so they don’t include my Alpha Luna works. And then, SOME art of those zip will be freed and posted here in the new gallery. I estimate about 4 months after being at the store. I hope with that everything is clear. I really appreciate all your support through the years! This option is specially designed for people who don’t like subscriptions and have issues with Patreon. That said this is my way to be fair with my Patreon subscribers too keeping the exclusiveness intact while being fair for people who are interested to see my work. I do also understand the concern of people and casual viewers thinking I’ve just moved all of my work behind a paywall. And again, the new gallery is intended to solve those concerns while still helping me to keep living out my work. That’s why I’ve only put Patreon content from 2018 for sale and not my past art between 2015 and 2016 that is YET to be posted soon for the new public gallery. That’s why I’ve removed “Two Howls” from the store because it will be also be released for the public gallery soon. And that’s about it. 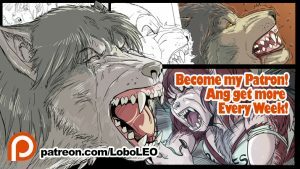 As always don’t forget to click a follow at my twitter that I’m using more often at https://twitter.com/loboleo where I’m even releasing some art work from time to time. No new for now. Just so you know I finally manage to rescue the files needed to re-upload the site as it was before. I’m not sure if there are dead links so I hope you tolerate some errors if you find them. I hope to add new content in the near future.